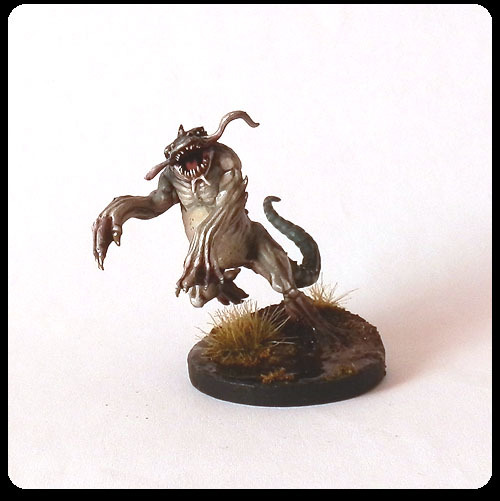 Another Silurid joins the Swampfiends. I'm gradually getting to know the crew as I play the campaign, and these jumping fishmen are just fantastic. Like his brother, this one was only slightly modified and painted in a matching colour scheme. 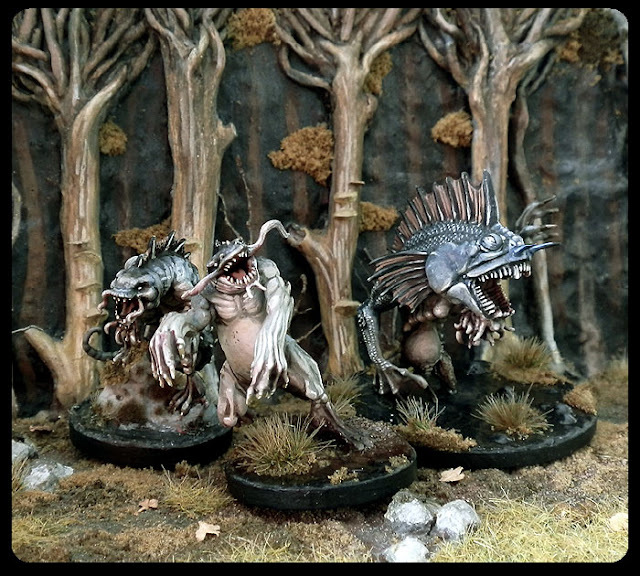 The first Silurid and the Spawn Mother's basing has them standing in water. This one is in a jumping pose, so I made him jump from a muddy bank into the water. As you'll see further below, this has to do with the display base I'll make for them. I also painted the original Gupp swarms I got in the Spawn Mother set because they are essential to how her crew works and I needed them for the campaign. I hate the models, though. 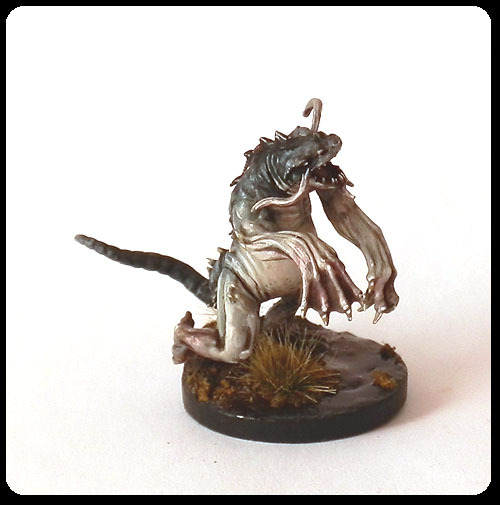 They are terribly cartoony and don't match the feel of the Swampfiend crew I'm going for at all, so I don't even want to show them here. They can't even be converted to fit. I do intend to make my own version of the swarms from third party bits that will have the right look, but that is not high on my priority list right now. The future display base. I don't have the right tools to cut neat round slots on the display base, so I bought some MDF round base extensions for that purpose. The base itself is a picture frame. I looove your artwork. I would buy your book, also the Silurid look great. Outstanding work, Ana. As always, I love your color choices. What did you use for the water on the bases? Thank you Finch! For the water I painted the area black and applied several layers of Vallejo Still Water. Spawn Mother's base has some green stuff bubbles to break up the large flat area. They were glued in place before painting and water effect. About the book, what would be about? The book will contain information about creatures from Croatian folklore. So intertesting! Please keep us informed! Thanks! Nothing like that for now. But if I get there I'll let you all know. They remind me of the Lurkers (?) from Hexen, they made me uneasy around swamps from a young age! The paintings look brilliant; what's your recipe? D'you use model paints? Stippling or drybrushing? Thank you! 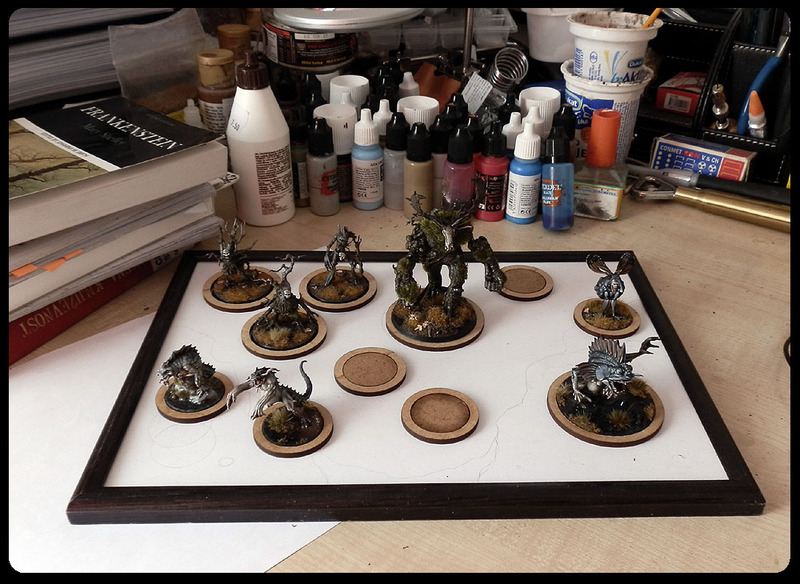 Yes, I use the same paints and brushes as for my miniatures. 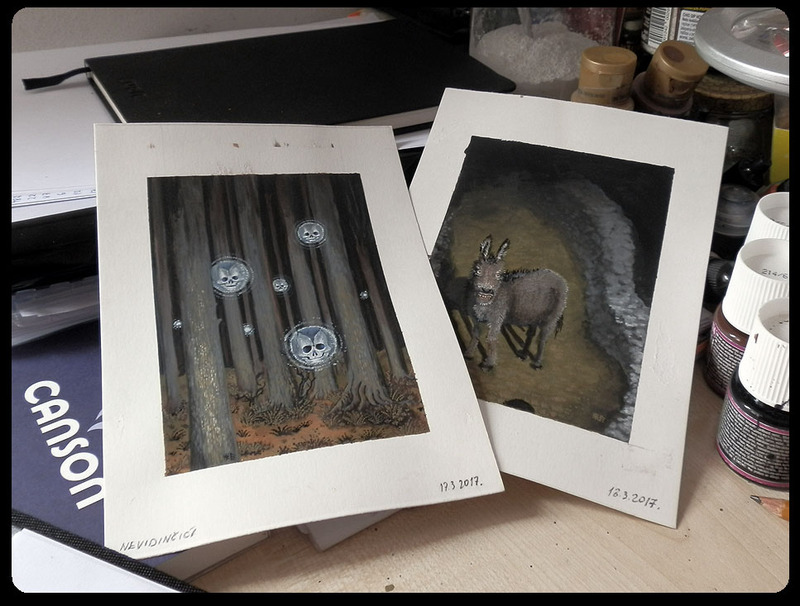 And the way I paint on paper is actually quite similar to my miniature painting. You can't see details very well in this photo, but take a look at the monstrous faces in the sidebar of the blog and you'll get the idea. The fish are just amazing,equaly disturning and fun. A potential book by you is an obvious must buy! Thanks Alexander! The book is far from done, but I'm hoping to finish it by the end of the year. We shall see how it goes. Beautiful colour scheme on the Silurid and well executed too.